[PRESSWIRE] London, United Kingdom – 16 March, 2018 -- Enviroshake® has launched the successful North American product called Enviroslate® in the UK & Ireland. The Enviroslate® offers the look of natural slate at ½ of the installed cost. Just like all Enviroshake® products, the Enviroslate® is a composite roof tile made from 95% post-industrial recycled material. Enviroshake® is the sole manufacturer of the Enviroshake®, Enviroshingle®, and Enviroslate® roofing products. Enviroshake® has been in business since 1998 making us a pioneer in the composite roofing industry. No other composite or synthetic product in the industry today, can rival the combination of Enviroshake®’s authentic look, durability, performance, and longevity. Having seen great success in North American market, Enviroshake® is pleased to open doors to the UK and Ireland markets. Being manufactured in Chatham, Ontario Canada, an hour way from the Detroit Michigan border, Enviroslate® is available in two different profiles, and 5 different colours to offer an authentic slate look. All of Enviroshake®’s product design is such that it shows superiority to other synthetics in performance, and aesthetics. Enviroshake® products are not susceptible to mold, mildew, fungus, rot or insect infestation. They are also hail resistant and can withstand severe weather conditions, temperature fluctuations and extremities. The Enviroslate® can even withstand wind speeds up to 290 km/h, or level 5 hurricane strength winds with an impact resistant of level 4 UL 2218. 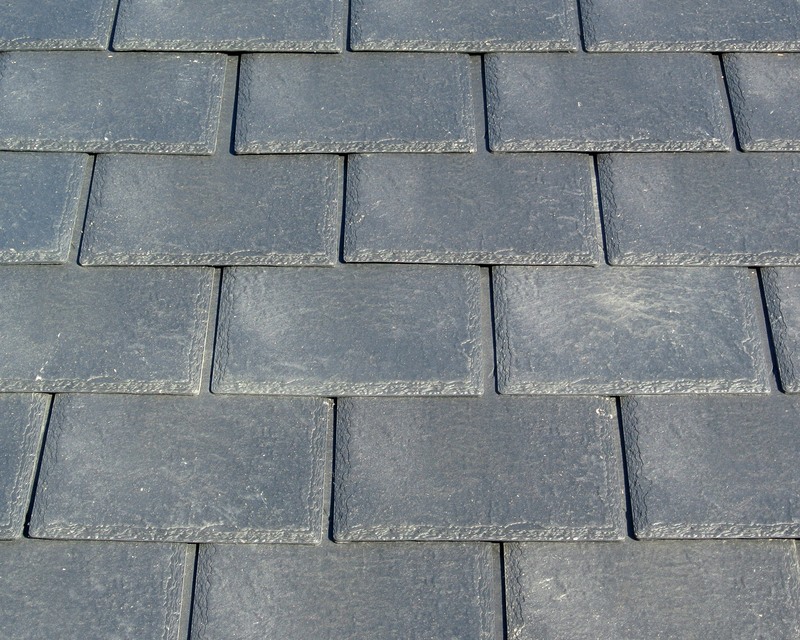 The Enviroslate® can be installed more efficiently than natural slate and once installed is maintenance free; since each Enviroslate® piece weighs approximately 2 pounds which is 3x less than weight of natural slate, it can be installed without roof reinforcements or on re-roof projects. The Enviroslate® will retain its physical properties and look for decades, without chipping, peeling, warping or cracking and is even sold with a lifetime warranty that is fully transferable within the first 50 years for residential projects, and a 50-year warranty for commercial projects. The installation process is also quite simple; every tile is 20” long and 12” wide. Enviroslate® is installed at a 9” exposure, and can be installed on roof slopes 2:12 and greater. Enviroslate® is available in two profiles with all bundles being pre-shuffled to include a mixture of both profiles, providing an authentic slate outcome. Enviroshake® is excited to offer various colour schemes to emulate the look of a natural slate roof. Enviroslate® is available in Onyx Black, Charcoal Grey, Stone Grey, Sage Green, and Plum Purple. By design all Enviroshake® products will have slight variations in shading and thickness of the tiles, giving the product a natural slate look on the roof. Enviroshake® will be exhibiting at the National Homebuilding & Renovating Show at the NEC, Birmingham UK March 22-25th 2018 in booth K116. Join us and see Enviroslate® for yourselves! Enviroshake® is ISO-9001-2008 certified, and have been operating under this certification for over 10 years. Enviroshake® prides itself on engaging in best practices, and we are always striving to minimize our environmental footstep. Enviroshake® is proud that its operation fulfills all the components of the 3R environmental agenda – reduce, reuse and recycle. For additional information call 1-866-423-3302 or info@enviroshake.com or visit our website www.enviroshake.com.